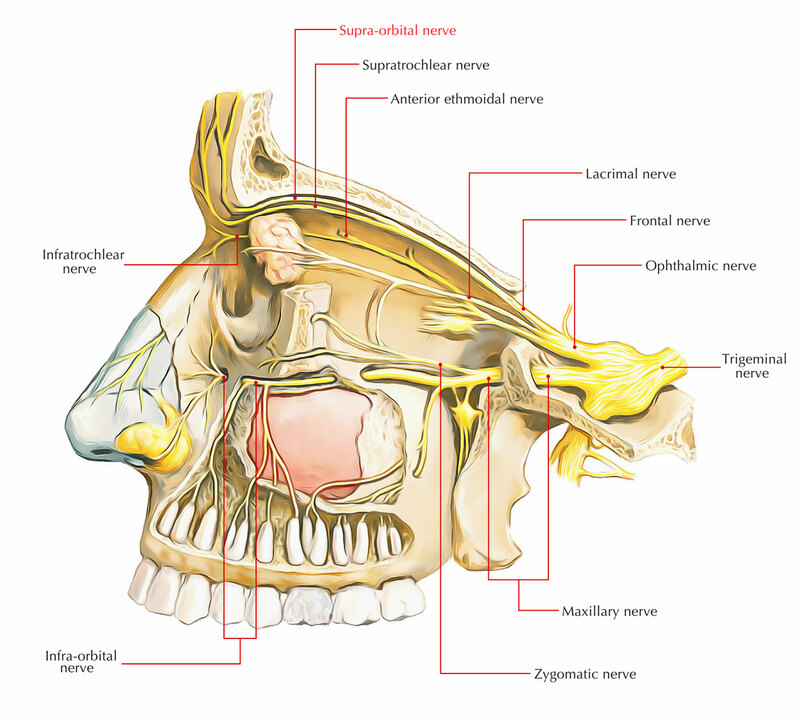 The supraorbital nerve is one of the two ending branches of the frontal nerve. The supratrochlear and supraorbital nerves originate from the frontal branch and at the time of cutaneous surgery over the orbit are the ones at maximum risk of injury. The supraorbital nerve emerges from fibers of the frontal nerve, the largest division of the ophthalmic nerve. The frontal nerve goes in the orbit via the superior orbital fissure and travels anteriorly under the periosteum of the roof of the orbit. The supraorbital nerve, which is the bigger lateral division. The supratrochlear nerve, which is the smaller medial division. The supraorbital nerve gives sensory innervation towards the forehead, upper eyelid, along with anterior scalp and transmits fibers towards the vertex of the scalp. Travels in the middle of the levator palpebrae superioris muscle and the periorbita enveloping the roof of the orbit. Keeps moving forward and leaves the orbit afterwards via the supra-orbital notch. Rises up through the forehead and scalp, supplies the upper eyelid and conjunctiva, the forehead, and posteriorly till the middle of the scalp. It afterwards terminates in two branches, a medial and a lateral, which supply the scalp, and the lambdoidal suture. Both branches supply small branches towards the pericranium. The medial branch perforates the muscle. The lateral branch perforates the galea aponeurotica. The supraorbital nerve innervates the central upper eyelid, ipsilateral forehead, and scalp. Damage to the nerve in this area will cause reduced or absent sensation in the particular location. The supraorbital nerve block is frequently used for achieving local anesthesia of the face, due to its numerous advantages compared to local tissue penetration. Anesthesia can be attained frequently with a smaller amount of medication from a nerve block compared to local infiltration. Nerve blocks give anesthesia without producing tissue distortion compared to local tissue infiltration. So, for conditions like facial lacerations where tissue distortion is unacceptable the supraorbital nerve block is far more suitable option.